Down Syndrome is a genetic condition that occurs when a person has three copies of chromosome 21 rather than the usual two. People with Down Syndrome usually have a characteristic physical appearance, significantly lowered intellectual abilities, and sometimes a number of physical problems, such as heart defects. All of these characteristics vary among affected people, and some people with Down Syndrome have fewer of these features than do others. Anna is somewhere in the middle of the range. She is moderately mentally retarded. Jason researched Down Syndrome for a school report and now worries about Anna's health. Many people with Down Syndrome have health problems such as heart defects, increased susceptibility * to infection, respiratory problems, and digestive problems. Childhood leukemia occurs slightly more frequently in children with Down Syndrome than in other children, and adults with the syndrome are at increased risk for Alzheimer's disease. People have Down Syndrome when they have three copies of chromosome 21 (or parts of chromosome 21). Chromosomes provide all of the genetic information needed for the cells of the body to work properly. Normally, most of a person's cells contain 23 pairs of chromosomes, for a total of 46. The exceptions are eggs and sperm cells, which have only one set of 23 chromosomes. Most people with Down Syndrome have 47 chromosomes, instead of the usual 46, and the extra genetic material causes developmental problems. 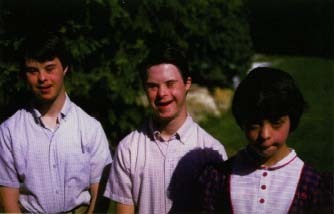 Down Syndrome can occur in three ways. * susceptibility (su-sep-ti-BIL-i-tee) means having less resistance to and higher risk for infection or disease. * mapping locates the positions of all the genes on a chromosome. An English physician, John Langdon Haydon Down (1828-1896), published the first description in the medical literature of a person with Down Syndrome. Jerome Lejeune, a French physician, found the extra chromosome 21. Chromosome 21 was the first chromosome to be fully mapped * . Ninety-five percent of people with Down Syndrome have Trisomy 21, meaning they have three copies of chromosome 21. This occurs because of an error in cell division called nondisjunction. Normally, an egg or a sperm cell has only 23 chromosomes. During the cell divisions that form these reproductive cells, the 23 chromosomes first replicate * and then separate, with one set of 23 going to each new cell. If the two copies of chromosome 21 do not separate, however, the result is an egg or a sperm cell with two copies of the chromosome instead of the usual one. At least 95 percent of the time, trisomy 21 occurs when a normal sperm fertilizes an egg with two copies of chromosome 21. When cell division begins to form an embryo, the extra chromosome is then replicated in every cell of the body. When the extra chromosome 21 breaks off during cell division and attaches to another chromosome, it is called translocation. In this case, the total number of chromosomes is 46, but the genetic material from the extra chromosome 21 that is attached to another chromosome causes the features of Down Syndrome. Translocation accounts for 3 to 4 percent of Down Syndrome cases. The third type of Down Syndrome is called mosaicism (mo-ZAY-i-siz-im). This occurs when nondisjunction of chromosome 21 takes place in one of the initial cell divisions after the egg is fertilized, causing some cells to have 46 chromosomes and others to have 47. Only 1 to 2 percent of people with Down Syndrome have mosaicism. No one knows what causes the chromosomal abnormality that results in Down Syndrome, a condition that affects approximately 1 in 1,000 babies. Any woman can have a baby with Down Syndrome. It is not associated with a person's culture, race, where they live, or how rich or poor they are. approximately 1 in 30 for a 45-year-old woman. * replicate (REP-li-kate) means to create an identical copy. Down Syndrome is the most common chromosomal abnormality in humans, and there are several ways to test for it. The triple screen test and the alpha-fetoprotein (AFP) test are commonly used to predict whether a woman is carrying a baby with Down Syndrome. They are called screening tests because they do not give a definite answer. Instead, they measure the amounts of certain substances in the mother's blood that can indicate a problem. If one of these tests is positive, it does not necessarily mean that the fetus (the developing baby) has Down Syndrome, but it does indicate that more tests should be done. Sometimes the test results are false-negatives, meaning that the test did not indicate Down Syndrome even though the fetus has it. Low levels of AFP in the mother's blood are correlated with Down Syndrome in the fetus, but the test detects only about 35 percent of cases. The triple test, which measures levels of three substances, is correct about 60 percent of the time. Pregnant women over 35, and women with positive results of screening tests, can be tested using several different diagnostic tests, such as amniocentesis (am-nee-o-sen-TEE-sis), in which the chromosomes from the fetus's cells are examined. Diagnostic tests give a definite answer, which means they are correct 98 to 99 percent of the time. For these tests, samples are extracted from the tissue or fluid surrounding the fetus or from the umbilical cord. On rare occasions, these procedures cause the mother to have a miscarriage (lose the baby before birth). Women who plan to have diagnostic tests performed should receive information and have emotional support available to help them understand the procedures and cope with test results indicating Down Syndrome and with the possibility of miscarriage. What Does Life Hold for Anna and Her Family? Most people with Down Syndrome have some degree of mental retardation, but many are able to go to school and to live at home with their families or in group homes that help them work independently. century, because of advances in clinical medicine, about 80 percent of people with Down Syndrome are expected to live to age 55 or longer. Anna's family learned all they could about Down Syndrome as soon as she was born. They knew Anna would learn to sit, walk, and talk somewhat later than her peers. Anna's family is providing her with a stimulating home environment, good medical care, and good educational programs. They are teaching her to be a happy productive member of the community. Whether she will ever be able to go to school or to work or live independently depends on the level of her mental development. However, Anna's family knows that the Americans with Disabilities Act of 1991 (ADA) will help protect Anna's right to live her life free of unnecessary limitations or discrimination due to her disabilities. Cunningham, Cliff. Down Syndrome: An Introduction for Parents. Boston: Brookline Books, 1995. Hassold, Terry J., and David Patterson. Down Syndrome: A Promising Future, Together. New York: John Wiley, 1998. Selikowitz, Mark. Down Syndrome: The Facts. New York: Oxford University Press, 1997. National Down Syndrome Society, 666 Broadway, 8th Floor, New York, NY 10012-2317. National Down Syndrome Congress, 1800 Dempster Street, Park Ridge, IL 60068-1146.